Out and about in this Spring like morning and a start from the Holpool Gutter. There were 4 Common Buzzard sat around the pallet yard next to the Growhow works. The 16 Mute Swan were minus their Greylag Goose companion on the field alongside the gutter. Lapwing and Golden Plover took to the air as a Buzzard passed too close for their comfort. A selection of Common Teal, Mallard and a Little Egret were on the gutter side and a Green Sandpiper was seen to vacate the area. Out on Frodsham Score were the usual large herd of Canada Goose with Pink-footed Goose present. I didn’t notice at the time but looking at the picture there may be some Brent Goose with them but hard to tell with the picture quality? A walk over to No.4 tank didn’t produce much other than the large Linnet and Goldfinch flocks and a few Reed Bunting. No.6 tank held good numbers of waterfowl eg Common Teal, Mallard, Gadwall, Common Pochard, Common Shelduck and Tufted Duck with 2 Little Grebe noted. A brief glimpse of a Water Rail was had as it dropped in to the reeds squealing and there were more Lapwing and Golden Plover flying overhead. We took the opportunity after our walk at Tatton Park to drop in at the marsh. A walk from Marsh Lane to Marsh Farm and back was fairly productive. Although I only had my bins for watching it was crystal clear out across the Mersey Estuary it would have come in useful if I had my scope though with all those gulls out there. What I could pick out from distance included: 70 Oystercatcher, 100 Curlew, 200 Common Shelduck and a selection of small to medium-sized shorebirds and of course gulls galore. Merlin attacking Starling flock (above and below images). The Starling murmuration didn’t really materialised but when a juv/female Merlin which I first spotted perched up at the farm had an eye on the loose Starling flocks passing through. Shortly after it made a bee line of flight to attack the flocks that had gathered by the reedy pool , with a slight diversion across No.2 tank to use the raised bank as cover. The murmuration that occurred so after the Merlin attack was good while it lasted. A Common Buzzard helped itself to a supply of dead lambs around the fields and these carcasses are certainly aiding the sustainability of both Common Buzzard and Raven in this area over the last few years. A Short-eared Owl was hunting the banks of No.6 tank and didn’t take too kindly to the attention of a couple of Raven en route to their Welsh roost site. Another Short-eared Owl was watched over the Weaver Bend as we were walking back. A small flock of 14 Fieldfare were looking for a roosting tree for the night. The evening ended with a splendid sunset over the marsh and then a stunning estuary bathed in crimson and blues as the sun departed for the day. Observers: Sparky, WSM (images 1 & 4-9). A walk around No.6 tank and onward through No.4 tank was highly rewarding with a fine male Merlin flew over from No.4 tank and settled on the ground by the Canal Pools, a second bird (female) was perched up in a tree on four. Other raptors noted were Common Buzzard, 1 Sparrowhawk and several Kestrel. Frodsham Score was alive with birds and included several Little Egret with a Great White Egret present. 96 Pink-footed Goose, c1000 Canada Goose and numerous Greylags were also feeding on the marsh grass with a 16 Whooper Swan. Although the tide wasn’t particularly high it was enough to force the 400 Wigeon off the river to feed on the turf. Small flocks of Dunlin could be see in clusters. The Golden Plover flocks have increased over the last few weeks with c1000 birds circling the marsh and what was presumably part of this flock relocated to No.6 tank later? A thorough watch over No.6 tank was really rewarding with decent numbers and variety of species. A drake Goldeneye was a surprise and not usually a species that occurs here. 29 Pintail (pairs) were again unexpected and a good count for this side of the estuaries. The more usual species included 187 Shoveler, 26 Common Pochard, 42 Tufted Duck, drake Wigeon, 23 Gadwall, 49 Mallard and 67 Common Shelduck. Shorebirds featured a few Dunlin, c100 Black-tailed Godwit, 1000 Lapwing and 760 Golden Plover. A Mediterranean Gull was seen from Marsh Farm (TB). Two Stonechat were by the farm and another two were on No.4 tank while a Goldcrest was also seen. The Cormorant tree held 11 birds with 2 ‘sinensis’ present. ‘TB’ had a conversion with an eccentric farmer who spent his time talking Bullocks! Observers: Tony Broome, Paul Crawley (images 7-8), WSM (Images 1-6 & 9). A walk out from Marsh Lane along Brook Furlong Lane and on to Marsh Farm this evening. A small group of Fieldfare and Redwing were along the hedgerow but little else of note was seen. Arriving at Marsh Farm and the fields were full of Spring lambs and another small party of Fieldfare were by the reedy pool at the farm. The Starling gathering on No.3 tank had already started to stream off the marsh with loose flocks heading out up and over Weston Point as they made their way to Runcorn bridge. Along the fence line bordering the track on Alder Lane, Marsh Farm were 2 male and a female Stonechat dropping into cover for food. The fields of No.2 tank held 15 Raven, 5 Common Buzzard and a Sparrowhawk adding to their number. A couple of views from the north-east corner of No.5 tank looking to where the wind turbines will be situated soon. Redwing and Fieldfare on Frodsham Marsh this evening. Observers: Sparky, WSM (images 1-9). The last hour along the Manchester Ship Canal as far as No.4 tank. There were 3 Little Egret and a flock of Pink-footed Geese feeding with the many Canada Geese out on Frodsham Score. The Mute Swan herd alongside the Holpool Gutter still had the Greylag Goose for company and a Great White Egret flew over the score possibly heading to roost at Hale? A Short-eared Owl sat on a post by the path and then started to hunt along the canal bank. Returning my observation back along the ship canal and a Great Crested Grebe was having trouble swallowing a Perch it had caught. Little Grebe, Gadwall, Mallard and Common Teal were also on the water. There was a large amount of Coot present. Back at my car and several Little Egret were going to roost in the trees near Ince berth. Observer: Paul Ralston (images 10-12). An evening visit but the usual location on No.6 tank was block by earthworks and a trench dug to accommodate the new energy lines to be inserted. I’m not sure how long these works will continue but it doesn’t look like a quick job. I watched from the south bank of No.6 tank but crossing a drainage channel I slipped and ended up with a thorough soaking of my boots and when my scope disappeared beneath the water I ended up with wet a sleeve. Composing myself but feeling the chill wind it was warming to see 200 Black-headed Gull already in situ bathing before their flight out to the river. A very impressive courting, feeding and paired up flock of 200 Shoveler were present. Also on the flooded tank were 29 Common Pochard, 34 Tufted Duck, 11 Pintail, 11 Gadwall. 570 Common Teal, 40 Mallard and 120 Common Shelduck. The roosting Lapwing flock were gathered in the shallower water with 4 Ruff and 12 Dunlin. Raven were typically active and everywhere in numbers and at dusk birds were watched heading south over Helsby and Fox Hills. A Short-eared Owl was hunting over No.4 tank and presumably the same bird was watched later over No.6 tank. The Cormorant roost contained 12 birds with at least one being a ‘sinensis‘. …and finally when the sun set behind the Growhow works it brought the birding to a close except for my wet and freezing trench foot which needed some warmth and very quickly. We’re delighted to say that the annual Bird Report for 2014 is now available (February 2015). This year’s eye-catching colour front cover is a stunning summer-plumaged Red-necked Grebe, which graced the Weaver Bend at Frodsham for almost two months. The 176 pages of text include 77 maps, graphs and tables, and 15 beautiful illustrations from three different artists. As usual, the colour map of the county forms the centre spread of the Bird Report. A total of 18 colour photographs, which best capture some of the highlights of the year, are spread over seven full pages. Local ‘patchers’ turned Red Rocks into a rarity hot-spot, when Citrine Wagtail, Tawny Pipit and Marsh Warbler were discovered in 2014. Sound recordings are an under-rated aspect of bird identification, in that the resultant sonograms can often provide a clear ‘footprint’ as part of the evidence to substantiate a record – which were provided in two out of these three rarities. Another article recalls the excitement of finding a male Little Bunting on Hilbre; the first record for the island, and also the first ‘boat twitch’ to the island as the tide was in! Back in 1930s, Spotted Crake used to breed at Burton Mere Wetlands (known then as Burton bog), but in 2014 breeding was again witnessed by the sighting of an adult pair and two fluffy black chicks. Hopefully they will become regular breeders on the reserve. Even the smallest of suburban gardens with an established feeding station can bring hours of fascinating birding with the odd surprise. This was true in 2014 when a redpoll bonanza occurred which included Common Redpolls, and more unusually, a Coues’ Arctic Redpoll. Last, but not least, there’s a striking account of 27,000 Common Scoters seen from Hilbre on March 3rd 2014 – one of those great wildlife spectacles that will always remain in the memory of those who saw it. All the ‘regulars’ are there: ‘Weather and Bird Review of the Year’; the full ‘Systematic List of Birds Recorded in Cheshire and Wirral during 2014’, including ‘Category E Species’; ‘Early and Late Dates for Migrants’; ‘Ringing Report’; ‘BBRC and County Rarities Decisions’; ‘Chairman’s Review’; and finally, advice on the Cheshire and Wirral Gazetteer, and the ‘Submission of Records’, including rarities. Last, but not least, we have again included a ‘Species Index’ at the back to help you quickly look up your favourite species. Just why Mark and I were at Frodsham Marsh on 26th Sept 1987 is long forgotten, though I expect it was promising weather conditions or a run of Nearctic waders in the country, since then, as now, it takes a lot to get me away from north Wirral. We had parked up near the log and not seen a great deal, despite walking up to and around the I.C.I tank, checking the Weaver Bend and even getting as far as the Bailey Bridge. Having struck out we started walking back round the IC..I tank, which held a largish gull roost, shimmering in the heat haze. I thought I could see something with a slightly paler mantle in the middle of them and was thinking Mediterranean Gull, which would have been quite a good find then. The combination of heat haze and distance persuaded me that I’d be better off if I scrambled over the edge of the tank so that I could rest my elbows on my knees and get a steadier view, sat on the inner edge. Just as stepped over the top, there was a completely unexpected explosion of black white and pink from the bare ground in front of me and a Hoopoe took off and flapped low across the tank. Normally when you find a good bird there is a short or sometimes long period of slow realisation as you piece together clues to its identity and you get a chance to work out how to communicate what is going on. Not so on this occasion. I knew it was a Hoopoe in the same instant as the photons hit my retina. I also knew that there was a chance that it might just disappear if I didn’t persuade Mark to turn round and come up the bank. He was watching the bend. I am told not a single word that came out of mouth made any sense at all (except a few choice expletives). Allegedly I was similarly incoherent when a Pallas’s Warbler interrupted my attempt to put yoghurts in the fridge, by flying across the bottom of the garden, when neither the words Pallas’s nor Warbler passed my lips. I blame the adrenalin. Fortunately on that warm day at Frodsham I managed to convince Mark of the urgency of the situation and he joined me on the edge of the tank while we watched the Hoopoe cross over the gulls and apparently land on the far edge near the bridge. Birding is truly back on the menu after my working day. I set off for the marsh with the intention of watching the ducks on No.6 tank but the stiff icy cold westerly and my thin coat put paid to that. I used the comfort of the car and selected to park up overlooking the mitigation area on No.3 tank. Although fully flooded and hopefully attractive to migrants in the next couple of months tonight it was a little understated. Lapwings out over Frodsham Score were disturbed by a low flying rozzer chopper and they flew up and down in impressive numbers. There were 12 Redshank on the flooded scrapes but these were soon joined by Lapwing moving in to roost from the river. A small flock of Fieldfare were feeding on the short turf by the Canal Pools. Shortly after the Starling flocks began to arrive and most stopped off for a collective bathe in the pools before moving off towards the bridge. Dave Craven over on the north side of the river estimated c35000 birds coming into roost on the bridge so I would be happy to agree with that number being present on No.3 tank. On No.6 tank the Tufted Duck numbers had increased from yesterday with 24 birds along with 44 Common Pochard, 174 Shoveler, 300 Common Teal and a selection of Common Shelduck. A flock of 70 Curlew flew in from the south for the night. There were 800 Lapwing on the tank with a solitary Ruff for company. The Cormorant roost numbered 9 birds two of which were ‘sinensis‘. 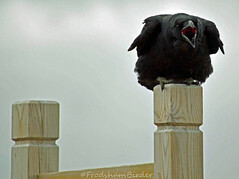 The usual Raven were hanging out waiting for more mutton laying about in the fields to feast on. A Common Buzzard was extremely tame on No.5 tank and a Peregrine was sat on top of the big chimney at Weston Point. The Liverpool skyline was clearly visible looking out from the track on No.3 tank.